Good news if you are a cosplayer! And if you have a car. And if you need to renew your Japanese driver's license. You can legally pose for your license while cosplaying. Granted, this isn't a mainstream trend by any means, but owning a "cosplay driver's license" is certainly possible in Japan, where they're also colloquially called "itai driver's license" (痛い免許証 or "itai menkyoshou"). In short, they're a regular license, but with the driver wearing a costume. According to manga artist Pikupikun, who recently posed for his own cosplay license, hats aren't allowed. Website Otakuma reports that unnaturally bright wigs also are also apparently not allowed. It looks like color contacts lenses are a-okay. Ditto for cross-dressing as schoolgirl characters (above). Nagoya-based cosplayer Amaguri Irufu recently dressed up as anime character Shirai Kuroko for her license. But way back in 2010, cosplayer Konomi Haruhara was already dressing up as Mari from Neon Genesis Evangelion for her license. It's not only cosplayers who take advantage of Japan's lax rules for license pics. 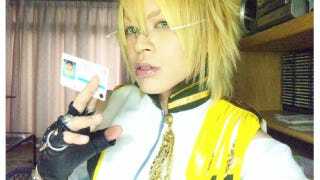 Members of visual kei rock band Golden Bomber proudly showed off their driver's license photos. One member even posed as a samurai, complete with topknot. Due to obvious constraints, you can't see much of the cosplayer's costumes. However, there's something wonderfully subversive and nerdy about cosplaying in your driver's license pic.